Readers may remember how I was rather underwhelmed by Metal Gear Solid V: Ground Zeroes because it was nothing more than the most hyped up demo in existence. When I played that, I also realized I would need to have played Metal Gear Solid: Peace Walker in order to get anything out of the story of The Phantom Pain, whenever that is coming out. Fortunately, my brother had a copy of the HD release for the Xbox 360. Metal Gear Solid: Peace Walker takes place about 10 years after the events of Metal Gear Solid 3: Snake Eater. Big Boss (aka Snake) is in the process of building his mercenary unit Militaires Sans Frontieres when he is approached to stop an American nuclear-armed weapon. Big Boss’ curiosity is piqued when he learns the Boss may be involved. Peace Walker felt like a return to more classic Metal Gear Solid gameplay. It is mission-based, and you have to equip Snake with an initial loadout, including his weapons and camouflage of choice. Gone are the days when you could change your camo on the fly a la MGS3 and 4, so you still need to be careful to keep yourself hidden. Controls overall feel like Metal Gear Solid 4, though Snake’s move set is far more limited so the game could be played on a PlayStation Portable, for which it was originally developed. One thing I did like was how it is now possible to chain CQC combos so you can throw multiple enemies in succession. This feature survived into MGSV. One thing I wasn’t so much of a fan of was many moves (such as interrogating an enemy soldier) required me to hit one face button while holding another one down; on an Xbox 360 pad, this did feel a bit awkward. Despite that it was easy enough to feel like the ultimate soldier Big Boss was known to be. Some can argue this was a little too easy, in fact. I think the enemy soldiers’ field of vision was noticeably reduced to make the game more forgiving as a PSP game as I remember standing in front of soldiers close enough that I totally would have triggered an Alert Phase had this been another Metal Gear game. I did read reviews that the original PSP game was supposed to have been very challenging, so I think the “blow up” process was what made the HD edition feel not so bad to me. In addition, none of the bosses were as memorable or as challenging as they were in other titles in the series. All the bosses you face are mechs which have pretty obvious weak spots and do a good job of telegraphing their moves. Some of them only become difficult because they have ridiculously large amounts of health, so it becomes a test to see if you have enough ammunition to take them down. Despite that, Peace Walker more than made up for its lack of challenge with the shear amount of content the game has to offer. In addition to the story missions, Peace Walker comes absolutely loaded with Extra Ops where you can take one of your recruited soldiers (be they kidnapped enemies or rescued prisoners) out and have them take part in various missions. They can range from finding documents to shooting balloons to recovering Snake’s gear. Some Extra Ops in fact do have ramifications that will make your progress in the story easier. In addition to these Extra Ops, you can assign people to your R&D staff to develop new weapons and items for Snake to use, and you can manage other stats to keep your army’s health and morale up. Overall, it’s great to feel like you’re running an actual private military company, and not once does it feel like a grind. I do have mixed feelings about the Outer Ops missions, where you can send soldiers and captured mechs out on assignments (you are running the business of waging war, after all). I come back to read the post-battle assessment often to see soldiers making pretty horrifically bad decisions. For instance, I’ve seen a soldier decide to use a Carl Gustav rocket launcher to kill an enemy infantryman, but decides to use a Tommy gun when facing an infantry fighting vehicle in the same battle. Just watching the battles play out feels frustrating. Graphically, I’m impressed with what the team managed to do with the PSP’s hardware. I’ve compared gameplay videos of the original PSP release to what I saw in the HD release. Naturally, the HD release looks far cleaner. It looks almost as good as Metal Gear Solid 3, which was one of the best-looking games to have come out for PlayStation 2. From a stylistic point of view, I think an interesting decision was having the cutscenes rendered like comic book frames with voice overs. 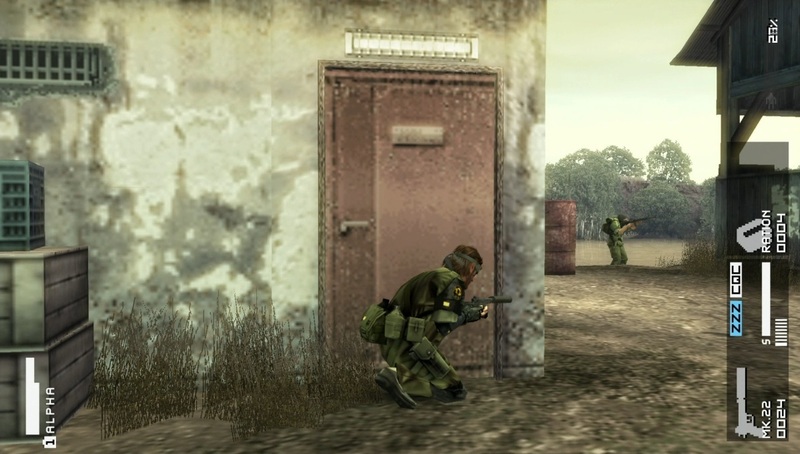 This originated in the previous game Metal Gear Solid: Portable Ops, ostensibly because the PSP wouldn’t be able to handle rendering cutscenes using the game’s engine. Overall, I was impressed with the cutscenes as they managed to convey what they had to about the story while having plenty of style. As far as sound: It’s a relief hearing David Hayter as Snake again. Overall, I would classify Peace Walker as the anti-Ground Zeroes. Peace Walker is very much “The Little Game That Could” in that you will spend at least a solid 30 hours getting through all the game has to offer. I think the HD release is a better use of your time and money than Ground Zeroes.